Just a few months after announcing their new 10-inch Axial-Glide Miter Saw, Bosch is continuing to expand their miter saw line with the addition of the new CM8S 8-Inch Single Bevel Sliding Compound Miter Saw. Bosch says they are answering user demands by coming out with a lightweight compact saw for greater jobsite convenience and portability. 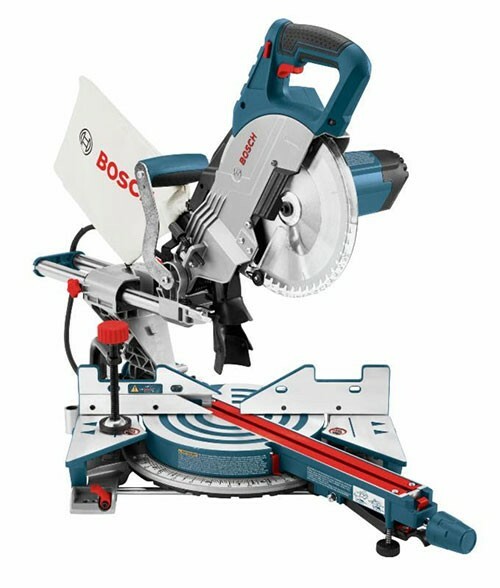 The CM8S shares many of the design features that are found on other Bosch Miters saws, such as: large easy-to-read miter and bevel scales, miter detents with easy override, and expanding side bases (wings) that increase the size of the table from 18 to 29 inches. The CM8S has impressive cutting capacities of 12-1/4-inch cross-cut at 0 degrees, 8-inch miter at 45 degrees, 2-3/4-inch upright base and 3-1/2 max crown. At 37-pounds, Bosch designed the saw to be carried with only one hand using a well-balanced top handle with a soft grip for added comfort. With 12 amps of power and a no-load rpm of 5,600, the fast blade speed should make the saw ideal for cutting trim and other woodwork. The only thing the Bosch CM8S doesn't have is the up-front controls that are found on their larger miters saws. Instead the controls have been moved to the side of the saw, which is still better than having them located on the back of the saw. The Bosch CM8S is available now with a suggested price of $469. BUY – Amazon.